LoanStart works by helping lenders and borrowers to find each other, which means that they do not lend any money. If you are looking for some money, you may want to check their conditions out. In this review, you will find some useful information about this service provider, including ratings, customer reviews, conditions, and more. This is an intermediary service between direct lenders and those who need to borrow some money. 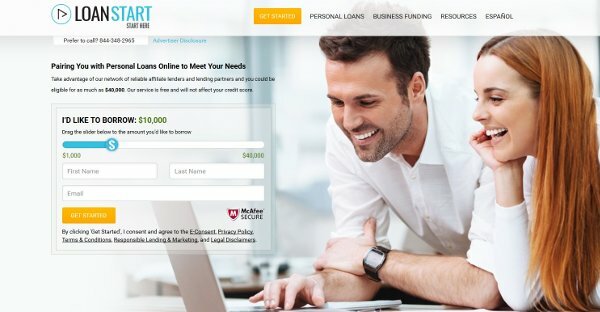 LoanStart.com has a large network of lenders, including LendingPoint, Avant, OneMain Financial, Prosper, Payoff, and others. Their services are free for their customers. They have a user-friendly website allowing filling out and completing an online application within several minutes. People with poor credit score may also apply, but it depends on the lenders if they lend money. It is possible to apply for a loan for any purpose, including car repairs, medical bills, home improvement, and others, and no collateral is required. They can be contacted either by phone or via an online contact form available on their website. No hidden rates or fees. The rating of the service on ConsumersAdvocate is 8.6 out of 10, which is excellent, but its rating on Trustpilot is only 3.7 of 10 based on votes of 55 customers, which is poor. Many complaints are related to too high APR. According to one review, APR offered to a customer reached 777%. There is no BBB rating available. This loan service allows enjoying a range of benefits, including quick and convenient application process; availability of many lenders, which allows finding the best rates, and others. Their ratings differ from one source to another, and they have not been rated by the BBB yet. At the same time, there are several complaints about too high APR offered by their lenders. Generally, you can check out what conditions you may be offered by this service, because if you have a good credit score, you may be offered pretty good conditions. You just need carefully consider rates offered at LoanStart before you make a deal with them.